Is there something that your family does that shows it’s part of a larger group? Some families make latkes at Chanukkah and that connects them with their Jewish heritage. Some families play tamburitza music together, and that connects them with their Balkan heritage. Kim Nishimoto’s family has a tradition that connects them with their Oneida heritage. People in Kim’s family make corn husk dolls. 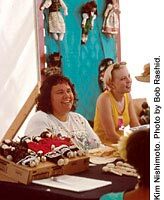 Corn is a very special food in Oneida culture and so are the dolls made from the husks. Years ago Kim’s great-grandmother, Amelia Wheelock Jordan, made corn husk dolls and now Kim’s son Adam can make the dolls too. That equals five generations of corn husk doll makers in Kim’s family! Why do you think making corn husk dolls was so special to Kim’s ancestors and still is so special to Kim and her family today? It’s their heritage! Kim is a member of the Oneida Nation, a part of the larger Iroquois Nation of New York and Ontario. Oneida people moved from New York to Wisconsin in the early 1800s. They brought with them their tradition of growing “The Three Sisters”—corn, beans and squash. Corn husk dolls show how important corn is in Oneida culture and that people didn’t want to waste any part of the corn. They found a wonderful way to use the husks by making dolls. Click here for an Oneida corn soup recipe. Oneida corn husk dolls are different from most other dolls in one big way—they don’t have faces! When Kim makes a doll, she leaves the face blank on purpose. Listen to Kim tell the story of how corn husk dolls came to be without faces. You can read along by clicking here. If you’re thinking, “Show me the dolls already!” you’re in for a treat! Just go to the next page!